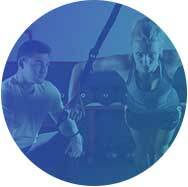 Our intensively delivered Personal Trainer course combines both the level 2 Gym Instructor and level 3 Personal Trainer courses using a blended learning method. The theoretical elements of the course are taught by e learning and the practical elements are delivered by intensively taught gym based sessions. The course is open to undergraduate and post graduate sport and healthcare students. This course is delivered by blended learning where all theoretical elements of the course are delivered by e-learning and practical elements of the course are taught with an intensive method of delivery. Students will have one month to complete all of the pre-requisite learning for the Level 2 Gym Instructor course and Level 3 Personal Trainer course. This will be delivered by e-learning where students will have access to a tutor throughout this process with any queries relating to the course content. The course is designed for undergraduate and postgraduate students eager to gain new skills and knowledge and increase their employment opportunities. The qualification will enable individuals to work in the leisure and fitness industry, in a gym, health club or for those looking to start their own business as a personal trainer. Students then select various units from the list below to specialise in their area of interest. All of the theoretical elements of the course are delivered by e-learning prior to the course with access to an online tutor offering support should queries and questions arise. The practical course will be taught over 7 days with a final day of assessment for both the Level 2 and Level 3 courses. People enrolling onto the course must be an undergraduate or postgraduate sport or healthcare student.